Origins GinZing Refreshing Eye Cream — This is my go-to morning eye cream. It’s infused with caffeine, so it helps alleviate puffy eyes and dark circles. It’s very refreshing after a night of sleep. The tiniest amount will do; I’ve had mine for about a year, and it’s still going strong. Dr. Brandt Skincare glow by dr. brandt™ revitalizing retinol eye cream — People tend to be scared of retinol, but I’ve been using this retinol eye cream at night for almost a year. It really is a miracle worker, and I’ve noticed my dark circles have faded and I’m using less concealer each day. 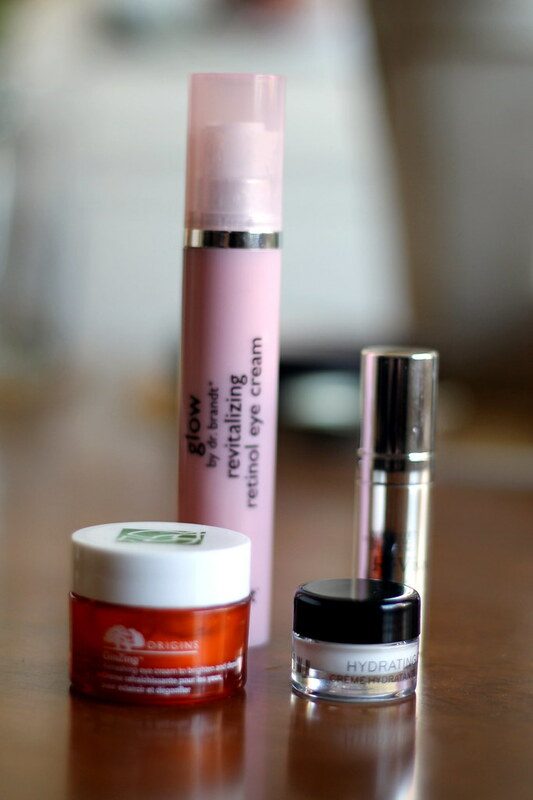 ReVive ‘Intensite’ Volumizing Eye Serum — This serum sample arrived in one of my Glossyboxes over the summer. While I certainly wouldn’t recommend spending $350 on an eye serum, if you happen to be looking for something outrageously luxurious, this serum is it. The tiny .1-ounce sample I received has lasted for a few months, and I’ve noticed my under-eye concealer applies much more smoothly since I started using it. Bobbi Brown Hydrating Eye Cream — I only recently started using this eye cream in the evening (I got a sample from Sephora). Somehow this cream manages to be hydrating without being heavy, perfect for winter.